Larry, and his wife Margie, have always had a passion for wine. “Prior to starting Cuda Ridge Wines, we would make countless trips to Napa and Sonoma, with friends and family, to enjoy the wines and the wine lifestyle,” says Larry. Larry begin making wine in his garage in 1999 under the mentorship of a family friend, grower, and winemaker, in Healdsburg. Larry and Margie planted a small family vineyard and built a barrel room in their garage in Livermore Valley for their winemaking hobby. Well, as Larry puts it, “this is a hobby gone wild.” During this time of home winemaking, Larry built relationships with the various growers and winemakers of Livermore Valley. 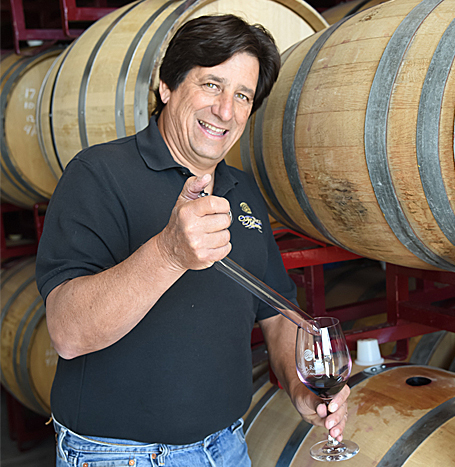 In the early 2000’s, Larry took several classes at Las Positas Community College primarily in the areas of Viticulture and Sensory Analysis. It was during this time the Larry gained a preference for Old World style wines. Larry and Margie founded Cuda Ridge Wines in 2007 with the premise of producing Bordeaux style wines exclusively using fruit from Livermore Valley. The Cuda Ridge initial offering comprised of Merlot, Cabernet Sauvignon, Cabernet Franc, and Petit Verdot. The Cabernet Franc was soft and elegant and quickly became one of Larry’s favorite varietals. Larry’s other favorite was the bold, and well balanced, Petit Verdot. Both of these wines have become signature varietals of Cuda Ridge Wines. Larry feels that it is important to produce balanced wines that brings out the best in food, and vice-versa. The other benefit of balanced wines is that you can enjoy several glasses during the evening while visiting with family and friends.